With a movie right around the corner, Star Wars is as popular as it’s ever been. 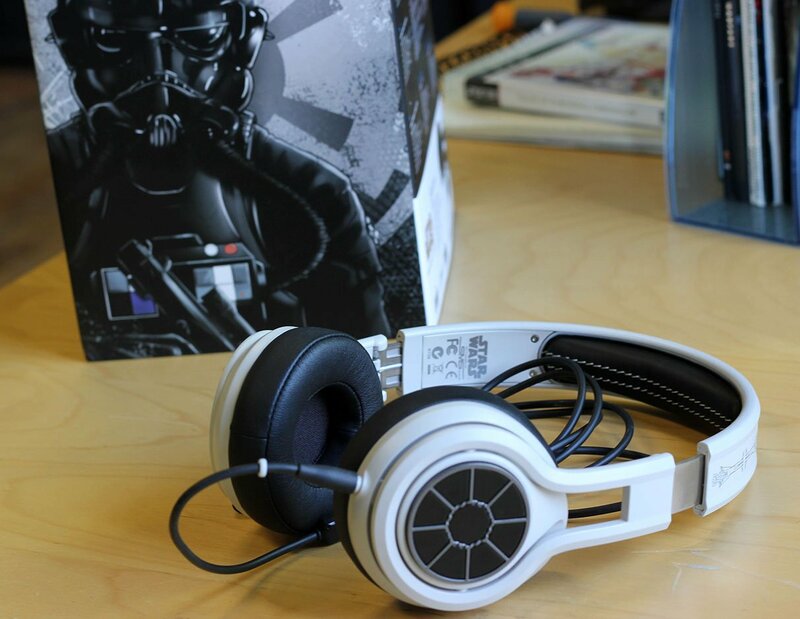 It’s licensing is everywhere, from shoes to videogames, that’s why last year SMS Audio was the lucky company to produce licences official Star Wars headphones. Mixing pretty solid sound output with stylish designs, we didn’t hate the first wave, but thought they were for a very specific audience. Now, a year later, SMS is back with a whole new series and not much has changed (except the reviewer). From the second you lay eyes on this box one thing is for sure, this is for a hard-core fan. Someone who doesn’t like Star Wars can probably spend their money a better way. But for that person who can’t get enough of the force, a $175.95 USD price tag feels like a steal. The headphones themselves aren’t the most comfortable set to wear. They’re foldable, but are made from a hard plastic with leather over the ear and the top of the head. The materials are fine for what they are, but they sit really tight on the head. While it’s great that they won’t move, there’s a constant reminder that you’re wearing something the whole time, and you don’t really get used to it. 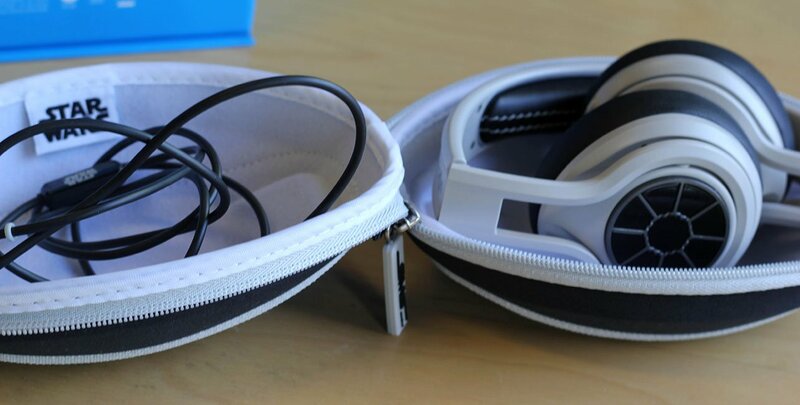 They also come with a removable auxiliary cable that connects to the left ear. This is a smart addition because you won’t get dragged down if the cable gets caught on something, and the wire itself comes with a microphone and a play/pause button. It’s nothing out of the ordinary, but there is a bit of a delay when you use it. That’s pretty common with that feature, but it was a long enough delay that I pressed it a bunch of times before it actually paused (then un-paused and paused again rather quickly). In terms of sound quality though, they’re great. Admittedly, I’m not exactly an audiophile, but I enjoyed the emphasis on the bass and drums while keeping it a little lighter on the treble. They also allow for some insane volume levels, so you can listen without the headphones actually on your ears. But it can catch you by surprise if you’re not expecting it, so check your volume settings before you pop those in because you really can hurt yourself. Despite that, they’re great for music and especially gaming. We tried them out with the 3DS and were astonished at how well the games sounded. The background music pops and every thud in combat gets an extra oomph that you don’t normally hear. It makes the whole experience that much more satisfying. 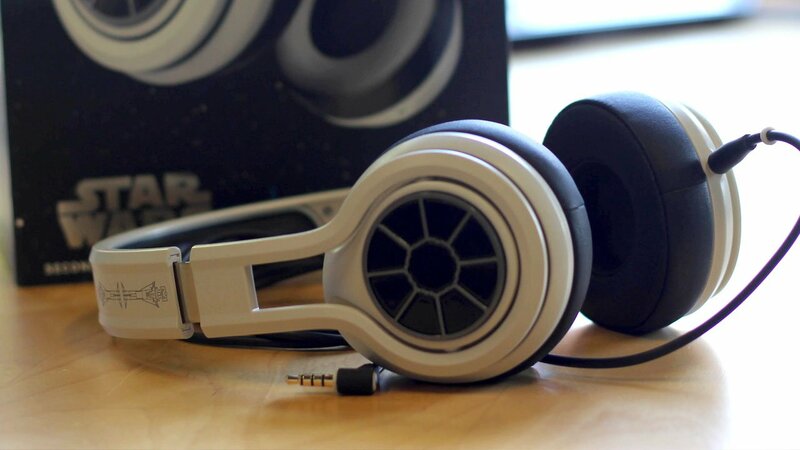 Let’s be clear, though, these weren’t made for sound enthusiasts; these were made for hard-core Star Wars fans that want something collectible. If that’s you, these will make you very happy. There’s a pretty wide selection of designs with Darth Vader, R2-D2, Chewbacca and the one we got, the TIE Fighter. With ours, we were treated to a nice light grey plastic with a silver design along the side. The leather is black but the stitching along the top is white. The actual ear covers are designed after the cockpit window of the Imperial spacecraft. They also come with a carrying case, a holographic picture, a sticker, a Star Wars cleaning cloth and a certificate of authenticity. Those are all nice touches that kind of make the price worthwhile. At the end of the day, that is what matters. For a collector, this might be your best option on the market. SMS did a great job at making a very specific item for a very specific market, and that’s great if you didn’t have a chance to hop on the first wave. The sound quality is solid, they’re made from decent materials and they’re freaking Star Wars branded. Those are all ingredients for a very happy consumer, if that’s what you’re in to. But the price tag is a little steep, they aren’t very comfortable and they’re geared towards a specific market, so unless you’re a super fan, these aren’t the headphones you’re looking for. Let’s be clear, though, these weren’t made for sound enthusiasts; these were made for hard-core Star Wars fans that want something collectible. If that’s you, these will make you very happy.